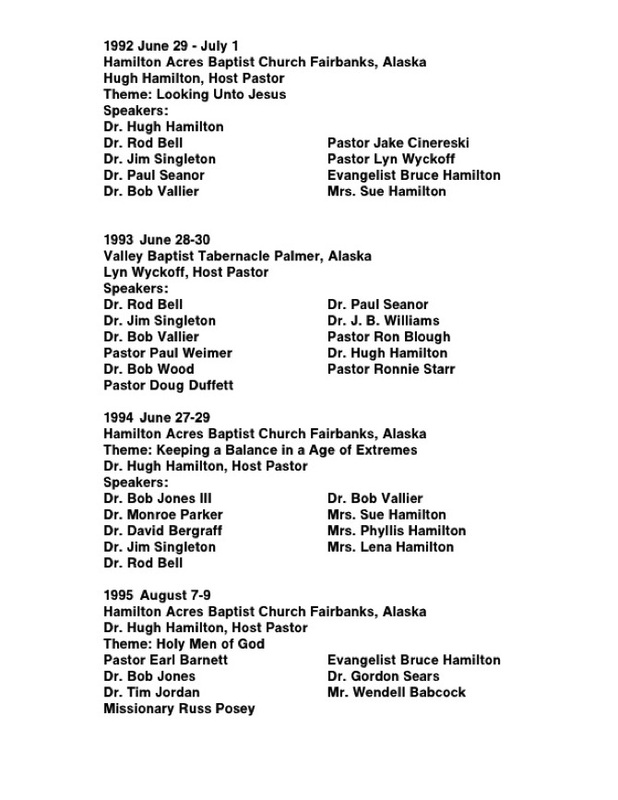 The Alaska Regional of the Fundamental Baptist Fellowship International had its organizational meeting in the summer 1991 at Hamilton Acres Baptist Church in Fairbanks. This meeting was a vision of Dr. Hugh Hamilton who had attended the National Meeting in Denver in June 1991. Pastor Earl Barnett and Pastor Lyn Wyckoff were a part of this organizational meeting. The first annual meeting was at Hamilton Acres Baptist Church June 29 – July 1, 1992. Annual meetings have held at these churches over the past 25 years: Hamilton Acres Baptist Church in Fairbanks, Soldotna Baptist Church in Soldotna, Immanuel Baptist Church in Palmer, Pioneer Peak Baptist Church in Palmer and Maranatha Baptist Church in Anchorage. God has provided, from the ranks of Fundamentalism, some of His choice servants to minister to us at our annual meetings. Listed below is a chorological listing of our annual meetings.